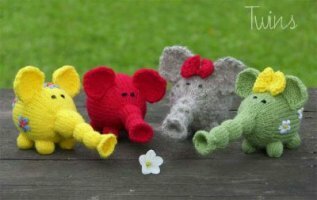 These gorgeous little creatures are almost enough to make me learn knitting. Yes, the dodo is extinct. But that's no reason for you to be without one about the house. Just what every home needs. Okay, I must be getting old, because I didn't even know this little guy existed! But isn't he cute? Now I really want to get one or two of his games for Wren's DS so I can play them while she's at school. 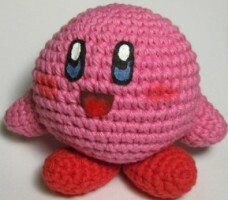 By the way, the pattern also has hats for Mario & Princess Peach, so you can dress Kirby up! These girls look like really fun little people to have around the house! 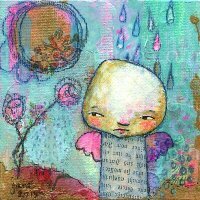 Just wanted to share with you a great way to get motivated to try new patterns. 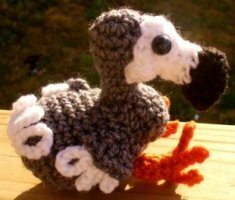 Use one of Planet June's Christmas amigurumi patterns (donationware or otherwise) and send her a pic or a link to where you posted about it or added it to flickr (or whatever), and she'll enter you in the draw to win a $10 voucher for her store. Second prize is a pattern of your choice, and all other entries will receive a discount voucher for the store. Well worth taking part in. Entries close on December 24th and all photos, (along with the name of the winner) will be posted on Christmas Day on the Planet June blog. 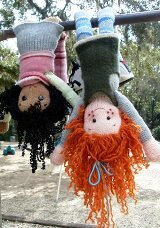 I've just figured out how to create a Facebook fan page for the Free Amigurumi Patterns blog! This collection of neat crochet fruit and veg includes grapes, apple, orange, carrot, pear, banana, tomato, celery and stuffed olive patterns! I just realised that for the first time (that I know of) I've accidentally posted a pattern twice on here! The fortune kitties are cute, but I still only want them on here once. 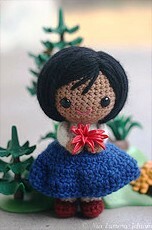 Very cute little girl amigurumi pattern. 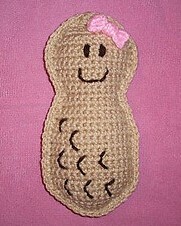 She's ideal for stuffing and using as a whimsical drawer sachet or wardrobe scent sachet. Cute, crying baby's bottle - or sew on a sweet little smiling face instead! This is a super-fun and super-simple crochet cat pattern, with a variety of easy techniques to try. Choose any combination of colours you like or stick to one.